Have you ever wanted to see what it's like to be behind the controls of a modern jetliner? Take control of a 737 and fly over your favorite city. The realistic design is easy to use and great for almost any age and experience level. Have you ever wanted to see what it's like to be behind the controls of a modern jetliner? Take control of a 737 and fly over your favorite city. The realistic design is easy to use and great for almost any age and experience level. 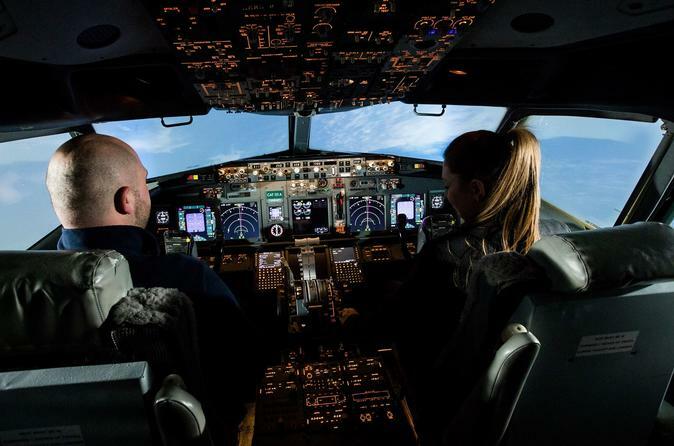 Take the controls of a modern Boeing 737 simulator, where you can fly over your favorite city with some basic handling lessons. This package consists of a 20 minute pre-flight ground briefing and 40 minutes of flight time. You can mimic real life flying, or simply land and take off from your favorite airport. With over 40,000 airports around the world to choose from, we're sure to have your destination! Up to 4 guests are allowed (two pilots and two observers).